Growing up in Germany means being exposed to different foods than kids here in America. I still remember the jelly, my grandmother used to make from homegrown raspberries, we helped her pick in the garden. Kids in Europe usually don’t know much about peanut butter and grow up on hazelnut spread instead. There are different brands, all with subtle flavor differences, featuring either a more nutty or more chocolaty taste. Ferrero’s Nutella is the leading brand, with the term Nutella being synonymously used for Hazelnut Spreads all over Europe. Not surprisingly, it’s also among the more expensive hazelnut chocolate spreads. The Nutella success story began in northwestern Italy, shortly after World War II, when master confectioner Pietro Ferrero used hazelnuts, which are plentiful in the Piedmont region of Italy, to extend the chocolate supply. 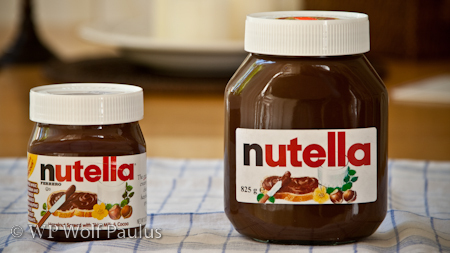 23 years later, in 1969, Ferrero U.S.A., Inc. was founded and Nutella was introduced to the US market. Today, the Nutella supply for the US is produced in Canada and somehow finds its way to my breakfast table quite regularly. 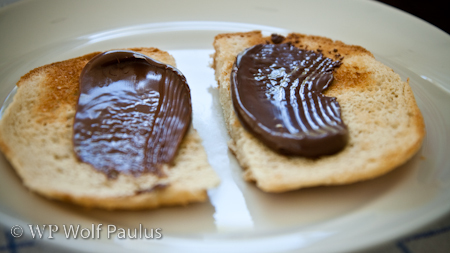 Lately, Nutella became more popular here in the US, (e.g. My Nutella – Rihanna Umbrella Parody, and was featured in the Los Angeles Times’ Food Section this February: Nutty for Nutella: spreadable joy however during a recent visit to Germany http://twitter.com/tompaulus and I made a disturbing discovery. The Nutella in Germany tastes differently than the Nutella here in the US and what’s even worse, the German stuff tastes much better. Back in the US we almost forgot about the taste difference, until one morning when we once again enjoyed the creamy goodness. But we weren’t sure anymore, if the German Nutella really tasted better and therefore decided to find out and do the ultimate taste-test. Like abovementioned, the Nutella here in the US is actually a product of Canada, and available in many grocery store chains like VONS, Ralphs, or Albertsons; the Store Locator may show some additional stores locations near you. Glass vs. 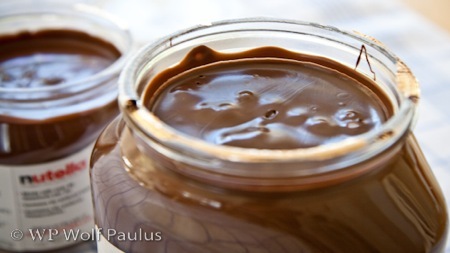 Plastic – a glass jar is a strong hint that you may have found Nutella, originating in Europe. Texture on the embossed text on the lid – all lids seem to be white with the Nutella name embossed. However, the German version has a dotted texture on the characters. Golden Foil – removing the lid reveals a golden foil, sealing the content. 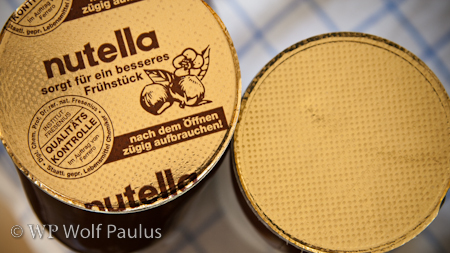 The North American version is blank, the German Nutella has the product name and additional information printed on the foil. To create fair and equal test conditions, we kept the two jars for one week in a dark location at room temperature. Opening the lids and removing the golden foil was already an eye-opening experience. The German Nutella is a little darker and the surface appear to be less shiny. The smell is even more telling that there must be a difference. The North-American product doesn’t seem to be releasing much scent at all. The German Nutella on the other hand has a noticeable nutty scent. 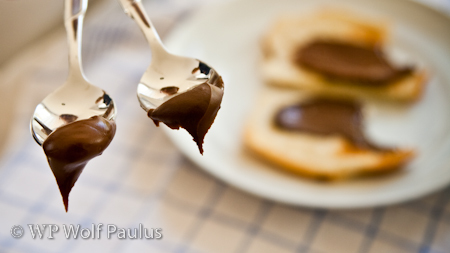 The widely-known Spoon Test showed that the consistency of the North-American Nutella is a little creamier and softer. Obviously, taste is subjective, and opinions differ even stronger, when it comes to food. However, all participating Nutella Testers (that would be http://twitter.com/tompaulus and http://twitter.com/wolfpaulus) agreed unanimously that the German Nutella tastes much more intensive, more nutty and chocolaty, when compared with the North-American product. One tester got blind folded and was still able to identified the Nutella’s origin in four consecutive tests. The German Nutella tasted better and not surprisingly, was strongly preferred during the meal following the Taste Test. If a European or German version is unavailable or simply too hard to get then we will certainly continue to buy the Canadian version of the Nutella product. However, I feel sorry for the typical American consumer, who doesn’t even know what the real stuff tastes like. There are many more examples like that. Take for instance the famous Harp Lager, an Irish beer (cousin of Guinness Stout) and widely available here in the US. The label clearly states Imported, a closer look however reveals that imported in this case means imported from Canada, where the beer is brewed and bottled. Again, the taste is different when compared to the real Irish Harp, which can be sampled in some fine Irish pubs here in Southern California. Seems like food corporations could do a much better job when introducing foreign specialties but instead are sacrificing quality for profit or maybe act just carelessly. Just like my grandmother did way back when, we should be spending our money more consciously, going the extra mile, buying products from companies that do the same. My first taste of Nutella was in Germany, 20 years ago, when Nutella became available here, I tried it and found it to taste like sugar. I told my children that the European version is so much better. Great post!